Dear Mary, you will forgive me not to write in English, but as we used to talk, it is easier to match also in the same language. Thank you very much for your letter. Unfortunately, she did not find in Darmstadt where I had hoped to be at this time, close to my dear promised [his wife, Princess Alix of Hesse]. In Spala, I accompanied my parents in the Crimea, now I am here, waiting to go I hope soon to see Alix. I will tell him to send you our photography [during his stay in Darmstadt, on the occasion of his official engagements a portrait of the couple was taken at that time]. Because I do not have any! The summer time is almost here, but even that has so far failed to improve the health status of my dear dad [Emperor Alexander III, is dying slowly, he was diagnosed with nephritis and mouura one month after that letter on Oct. 20, 1894]. It is so small that it walks with difficulty. When he sleeps well, he feels the next day "ragaillardi and stronger, but when the nights are bad, it is most of the time. I am sorry to tell him, then throughout the day it is different, breathing is difficult. You may not know it is terribly sad to see him in such a state. Dear dad, who was always the health and even force, did not concerned about his own state. All this has done to my poor mother, who cares for him, day and night, suffering from lumbago fort, which had just go after twelve days! God agrees that this winter in Corfu, brings to my dear father rest he needs, give him his forces and face look like before. Would you like, please send my best memories in your father [Robert, Duke of Chartres (1840-1910)]. I hope that his visit to Switzerland he will do good! Goodbye, dear Mary! Believe me, your ever loving. My dear Mary, I apologize for my long silence and also to have to answer in English and not french, but when we used to speak a language with a person, it's hard to write him in another. I have done what you asked and can give you a clear answer. That is emphatically not the case and is now in the water! I learned that the poor little Aage [Aage prince of Denmark (1887-1940), son of Princess Mary] was very ill and you all have passed through many problems and anxieties. Thanks be to God, he is going better now. So I hope he will return soon and will be as strong and healthy as ever. I am really sorry that we can not come to Denmark this fall. We have not seen the last two years! We need to be present at the inauguration of the monument of my grandfather in Moscow in August and then we will go to Crimea where we stay while the fall. Here, I must inspect the fleet from the Black Sea, which has increased greatly in recent years. Please send my affectionate remembrance of the beloved Waldemar and the old Georgia [Prince George of Greece (1869-1957)] and all your children if they still remember their old cousin. Goodbye, dear Mary, I wish you happiness and good health and I remain your affectionate friend. 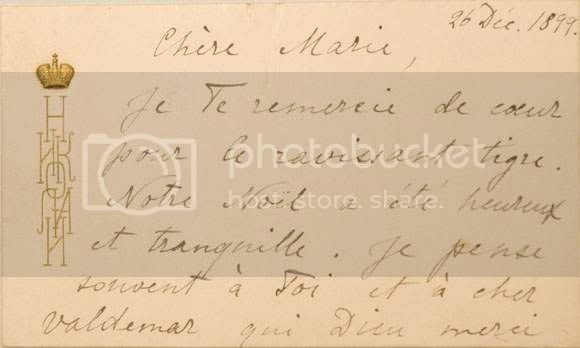 Letter autograph signed: "Nicky", October 1, 1903, addressed to his brother, the Grand Duke Michael Alexandrovich of Russia (1878-1918), p. 4 In-4 °, on headed paper from Wolfsgarten Castle, the residence of his brother, the Grand Duke Ernest Louis of Hesse. Stored with the envelope also at the hands of the emperor. Translation "My dear Micha, now three weeks that have passed since we arrived in Wofsgarten. Alix [Féodorovna Alexandra, wife of Nicolas II] and I constantly think you are sorry and that you may be left alone, since Tonia, [nickname one of the daughters of King Edward VII] left Denmark, she talked a lot about yourself and life that you have done there [in Fredensborg Castle, in King Christian IX of Denmark, his grandfather ]. We experienced much joy and pleasure to revisit. pained It seemed to be a party so hurriedly. We are surrounded by our whole relationship that we do not have the pleasure of seeing often. days are very responsible . Before marriage ceremonies [it sâgit marriage of Prince Andrew of Greece 1882-1944) with Princess Alice of Battenberg 1885-1969), celebrated on October 7, 1903, they are the parents of Prince Philip, the Duke of Edinburgh] , it was a time rather stormy summer. Yesterday we left Darmstadt (...) Where we are now life is quite different quieter and more airy. My trip to Austria went well. us we travelled by car in the hills to hunt and it was very interesting to admire its beauty. Fifteen verstes then we learned geese. I have never seen animals as beautiful and grasses. we fourteen have been killed in two days, wounded three and missed a few, which makes us an array of hunting seventeen taken. We were in Frankfurt with two cars make some necessary purchases then we returned. We were very happy this walk. here because the roads are well suited to this kind of drive. During this trip we met a former minister and Archduke Franz Ferdinand [crown prince of Austria-Hungary, murdered in 1914 Sarajevo]. We did a simple walk in the vicinity. while others went back to Frankfurt to attend a performance. They have a lot of fun. Have you talked to mom D.? This m ' annoys a lot for her and D. I am sorry, my dear Micha, but I have to finish this letter. God be with you. Sincerely yours. " Nicolas II, emperor of Russia (1868-1918). Map autograph signed: "Nicky", December 26, 1899, addressed to her aunt, Princess Mary of Denmark, born Princess of Orleans (1865-1909), p. 2 In-12, the figure of the emperor in gold letters. How strange. Any more info about this? What kind of code was it? Do they mean that the code was written down in the book then used in the correspondence, or that it was just a book of correspondence or something? :? 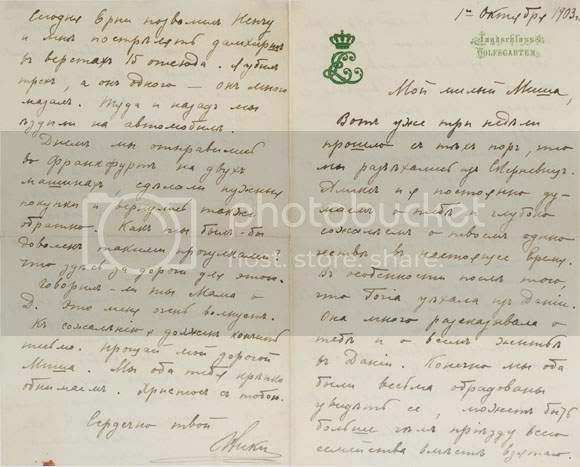 I wonder if anybody who has in his (her) possession or just read the book The Secret Letters of the Last Tsar: Being the Confidential Correspondance between Nicholas II and His Mother can tell me whether or not it contains the letters dated from 1894 to 1904. I would really appreciate any help in this matter. It has some letters of this period. Re: Code used in correspondence? I remember reading this. I thought it was in Nicholas and Alexandra. I have been searching for it and can't find it. Though the dim recesses of my mind can't quite grasp the full thought. It seems to me that in the early part of their relationship that they did indeed write in code to one another. Possibly between their engagement and marriage. Obviously with the volumes of letters that survive they didn't always write in code. Somewhere in this Osborne house plays a part. I may have this all jumbled. Meanwhile, I will continue to research this. Because now I am curious! The book starts with letter from 1879 and ends with the last letter from November 1917. There are 9 letters from 1894. There are only three from 1904, but the Russo-Japanese War was in progress. I actually thought that when Alix wrote down everyones temperature, she might be giving some sort of code, maybe coordinates. When I put some of the numbers together as if they were latitudes and longitudes, I came up with a location in Turkey. It was kind of interesting trying to see if it was some sort of code and trying to decipher it. Alix, her brother Ernst Ludwig, and her friend Tony Becker also wrote in code in some of their private letters. It was the same code as used by Alix in her 1894 diary. The code she used with Nicholas may have been the same too. What's the summarize of the letters? I belive the code was used to talk amoung the family without letting there captures know what they were saying. Talking about the jewels; where they were hidden and also the means of escape. It is impossible to summarize the letters. They discuss so many different topics, divorce, travel, advice, various ceremonies Nicky is involved in, and a lot of talk about who Nicky has placed in various positions and what they are up to. If you are looking for a summary of a certain date, I can give that to you. I am surprised she used a code so early on. Was there some sort of threat or danger to her that she needed a code?